Follow the adorable, spirited Peg and her sidekick Cat as they embark on adventures, solve problems together, and learn foundational math concepts and skills. In each episode, Peg and Cat face A REALLY BIG PROBLEM, a messy funny crisis they must somehow solve without totally freaking out! 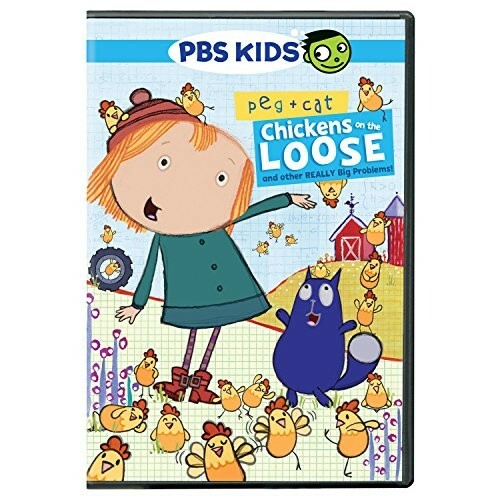 This DVD features 8 fun-filled adventures including The Chicken Problem - Peg and Cat have to get 100 chickens back in the coop before the farmer sees; The Messy Room Problem - Peg and Cat sort through the mess in Peg's room just in time for company to see Cat's masterpiece, The Circles; and The Dinosaur Problem - When Peg and Cat get lost riding dinosaurs through a prehistoric forest, they use a diagram to find their way to safety before the Baby T-Rex catches up to them.